Designed for computer projection in the classroom, training room, or anywhere a laptop drives the presentation. 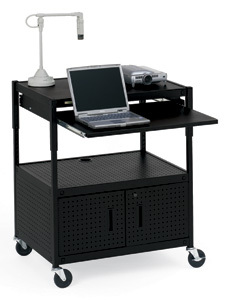 The pull-out laptop shelf, with positions adjustable between 29" and 37" high, is wide enough for both a laptop computer and a mouse pad. Large locking cabinet secures equipment and includes perforated holes to ventilate electronic equipment.